There are so many advanced personal vaporizers on the market it’s kind of difficult to really stand out from the crowd. Naming your company Voopoo is a good start for getting attention. Couple that with a snazzy, sparkly finish on the side of your device and you’re off to the good start. Disclosure: this review contains affiliate links, and I received this product at no charge for review purposes. My quick impressions when I first opened the box were that the device was a bit lightweight for how huge it is. I also got the impression that this device wasn’t terribly refined. Of course I spent some quality time with the product to form a complete opinion. Let’s get to the Voopoo Drag review, just on the other side of this handy product information card. Price: $69.99 $39.99 with coupon at the end of this post. The Drag offers what you’d expect in a modern personal vaporizer. It has both variable wattage and temperature control for a variety of coil types including stainless, nickel, and titanium. Swapping between the four modes is straightforward enough. Click the fire button three times quickly to cycle through the different modes. This vaporizer has what’s called a super mode when it’s in variable wattage mode. Basically, it’s sort of a safeguard to keep you from accidentally cooking your coils. The wattage increment will stop when you’re increasing the wattage up to 129 watts. If you hold the + button down again, you’ll enter super mode. Basically, that lets you go up to 157 watts, because, why not? I tend to keep my vaping under 100 watts, so I didn’t really enter super mode a whole lot. It is very useful for quickly cleaning coils, however. There’s also the now-ubiquitous USB charging port. Like most Advanced Personal Vaporizers you should avoid using it to actually charge your batteries. It makes you think the port is kind of useless. But, fear not. The port is also used for software. Voopoo makes available a desktop app (Windows only) as well as upgradable firmware. The firmware is installed by the app as well. The app is a bit on the ugly side, but it did work well, allowing me to download the configuration, as well as make changes. 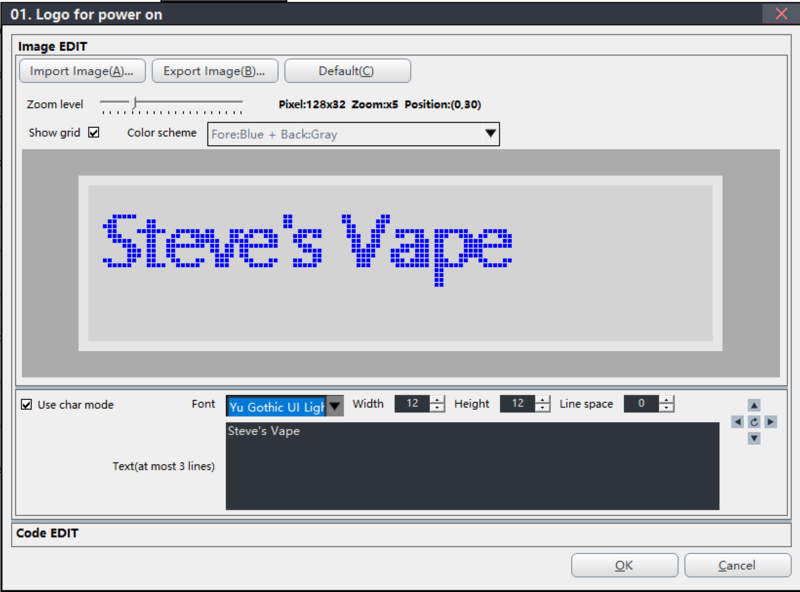 You can change most of the text, and you have the option to upload a tiny image to the boot up screen. I opted to change the text there. In addition to the settings adjustment there are screens to adjust the power curves for wattage and temperature modes with four presets. You can also modify the calculations for temperature control modes if you math like that. I’ll be honest, I’m torn about this device’s design. One one hand, it’s pretty solid. I know my initial impression was that it felt cheap. But after a little use, I’ve come to appreciate the lightness of the Drag. The fit and finish is actually quite good. The large battery door fits seamlessly, yet the little indent makes it easy to pry the door open when you need to switch batteries. The part that does feel a little cheap to me is the shiny color panel on one side. Even though the aluminum frame around the color splash is perfectly fit, the color bit still feels like a sticker. I’d also love if there was an option to swap that panel out with other panels. Now for the bad. I hate this thing’s design. It’s too big, and it’s too sharp. It could just be a me thing, but I find that the Drag is a bit too wide to comfortably hold. It’s much wider than just about any other 18650 mod I’ve used. To top things off, there’s a lot of sharp edges on this device. Most companies like to round the edges on devices to make them more ergonomic. 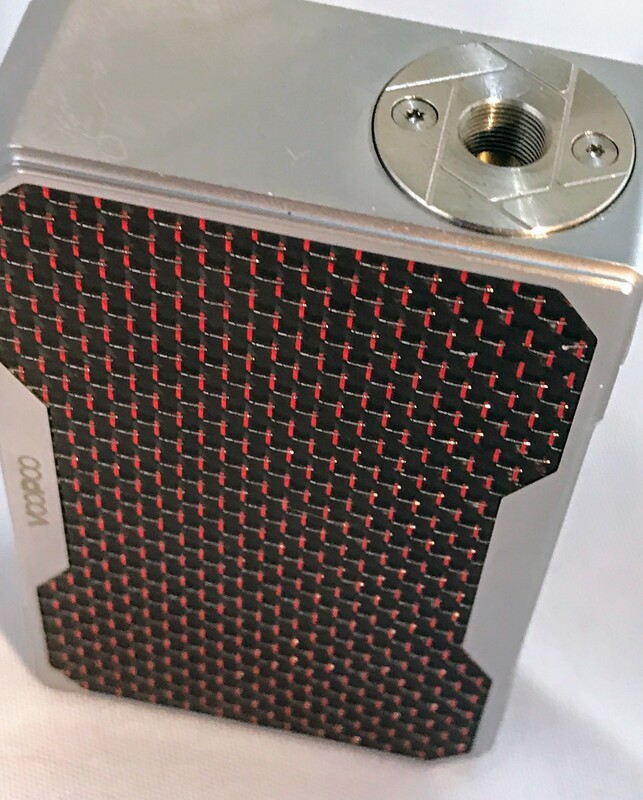 While the Voopoo Drag does have some rounded edges, many of those edges are just way too crisp. I find that they dig into my palm while I’m using the device. I don’t care for that. 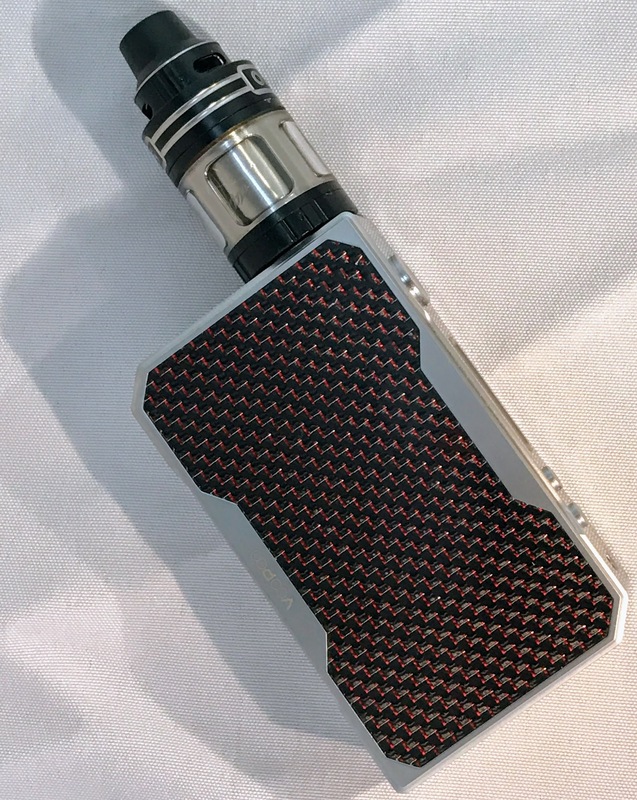 While the design of the Drag is a bit hit and miss for me, the performance is another story. Voopoo uses a controller called the Gene chip. In addition to being able to push a lot of amperage around, Voopoo brags the response of the chip is the fastest on the market. Honestly, I thought that was kind of a bunch of nonsense. But as I switch between the drag and other devices, I can really tell a difference. Vapor production was nearly instantaneous. Usually there’s a split second delay before you start getting good vapor out of your tank. It seemed like that split second was a whole lot less when my tank was bolted up to the Voopoo. I also feel like the device did a good job at consistently keeping the wattage where it said it would be. Even toward the end of the battery life, the vapor production didn’t weaken much. Speaking of battery life, the Drag does a decent job of managing that as well. A pair of 18650’s will last me most of a day on a full charge. Of course, it also depends on how you use the device. If you decide to kick on super mode, you’ll probably get a few minutes of battery life. Voopoo put out a pretty competent vaporizer with the Drag. While I’d like them to go back to the drawing board with the design, it’s a great device under the surface. 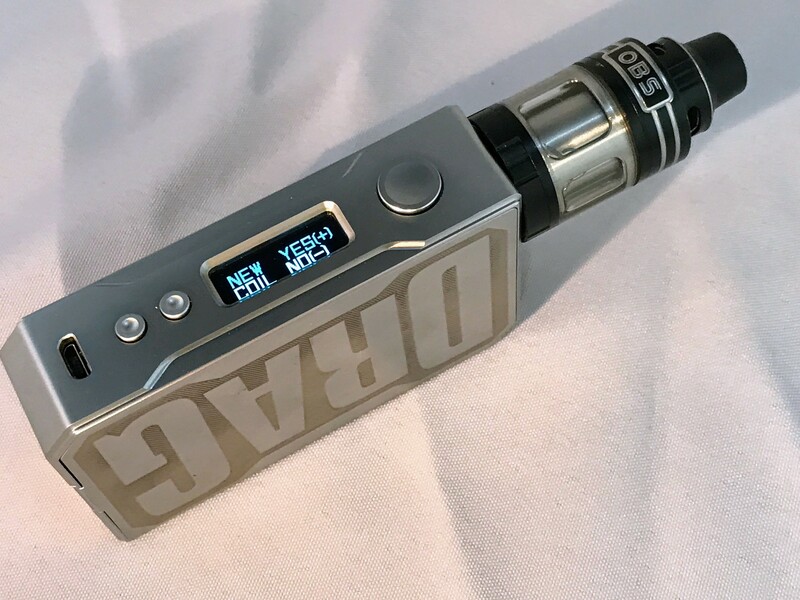 Not only does the Drag perform well, but it’s also software upgradable and you can make a lot of little tweaks under the hood with the software. I just wish it was also available for Mac and Linux. I promised you a coupon code at the beginning of this article, and I don’t plan on disappointing. The Drag retails for around $70, which if you ask me, isn’t worth it. But, click here to visit eFun.top and use the coupon code “thirty” to get the Voopoo Drag for only $39.99 which is a much more palatable price.